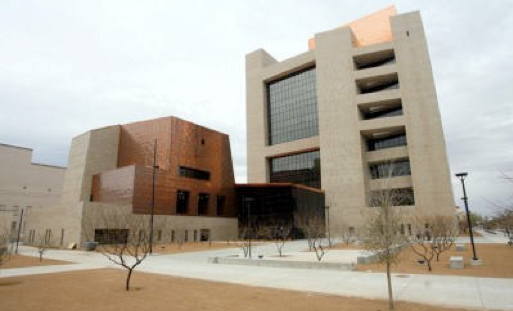 U.S. Federal Courthouse in El Paso, TX opens with the help of MBA. El Paso, TX - The new U.S. Federal Courthouse opened on July 12, 2010 with the help of McKown Belanger Associates (MBA). The team has worked diligently on the project the past nine years. MBA's services ranged from Construction Documents to Furniture Design and Acquisition to Move Coordination. MBA designers helped to select interior finishes, space plan and layout the nine stories, 10 courtrooms, and a special proceedings courtroom on the top floor, and selected all furnishings. Throughout the entire process, sustainable finishes and furnishings were considered and specified. Construction Documents, Specifications and Cost Estimates were all done within the Albuquerque office. MBA worked closely with the Court personnel and movers to ensure a smooth move from the 75-year old Federal Courthouse to the modern new building. "The relocation was the largest of it's kind in our district. I am pleased to say that the relocation was a success, and all of our tenants are happy." - Sonia Hogeland, U.S. District Courts, Western District of Texas. MBA team members had to work together closely and efficiently on a project of such grand scale. Seaton Project Manager, Bob Alderman, praised the team as "hard working, efficient and helpful." 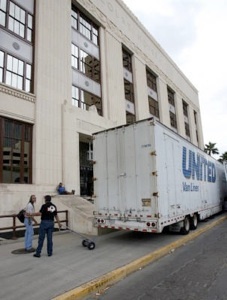 Stephen Brittenham assists movers at the old Federal Courthouse. 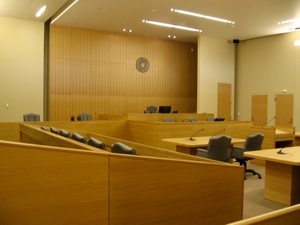 The interior of one of the 10 Courtrooms, features contemporary Anigre wood, sustainable Cork flooring, and metal accents.